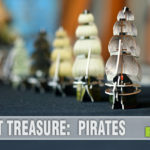 Even before attending the Origins Game Fair we were hearing buzz about a new card game by Osprey Games that was a must-see. 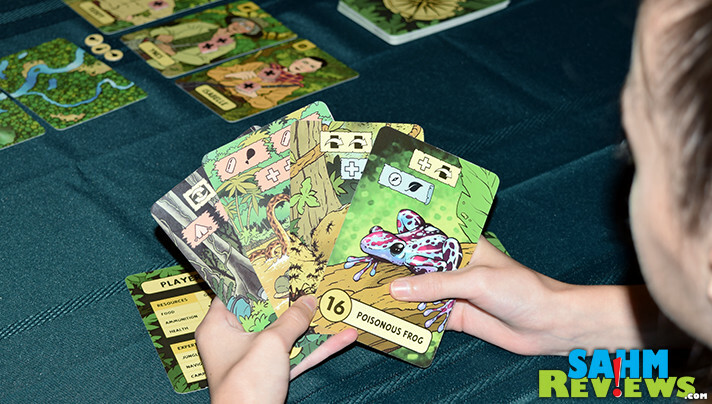 We had teased its release in our annual list of games making their debut at Origins, but other than some promotional copy received by the publisher, really didn’t know much about the game at all. 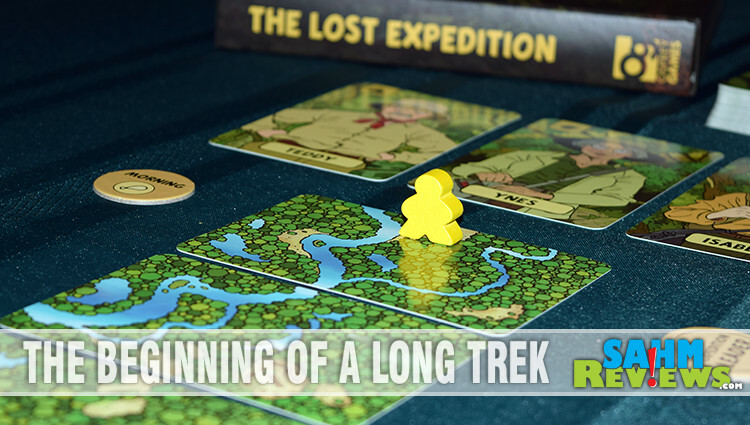 After seeing The Lost Expedition in person at the show, and watching dozens upon dozens of customers rave about it on the various Facebook groups devoted to board games, we knew we had to take it for a spin ourselves. Cooperative games are probably our favorite to play as a family as they (usually) end without hurt feelings. We share in our victories, as well as our losses. Age doesn’t matter because we can pull from everyone’s life experiences and abilities. It’s kinda like those summer team-building retreats corporations like to put their employees through. Work together to win, and if you don’t you’ll fail. 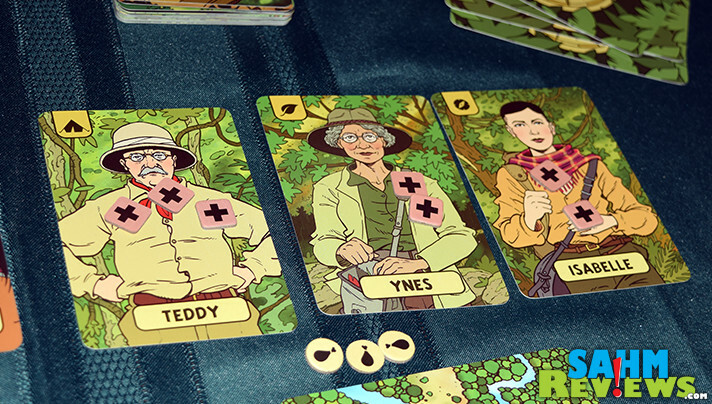 Loosely based upon the real-life expedition of Percy Fawcett’s attempt to find El Dorado, The Lost Expedition is a cooperative-style card game where all players are working together and will either all win, or all lose. You’ll be leading a team of three explorers to follow Percy’s path, making the best use of your resources and experience to survive. 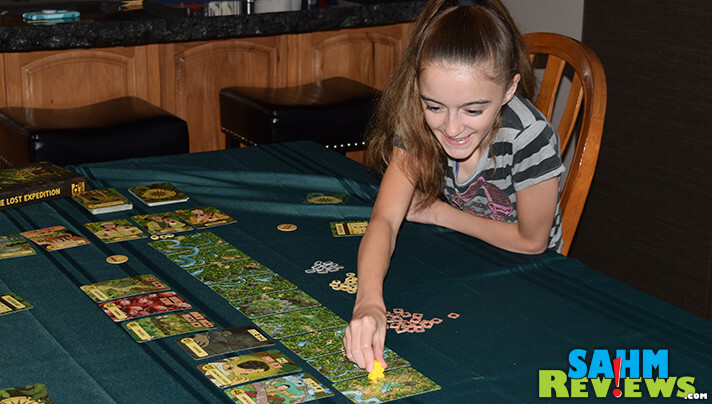 To win at The Lost Expedition, you need to only get one of your explorers to El Dorado alive. 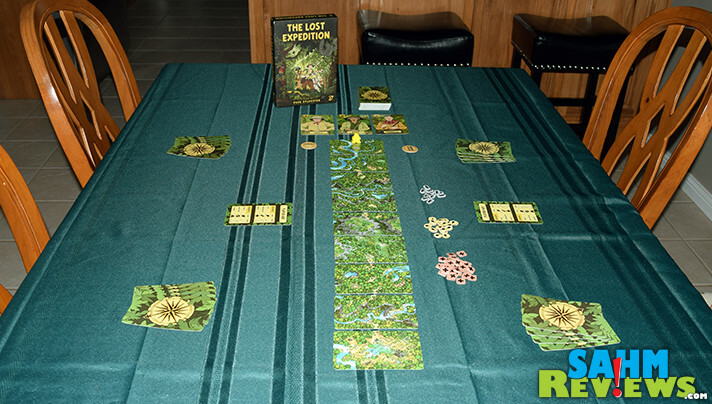 Regardless of the number of players (the box suggests one to five players), you’ll play a round of The Lost Expedition with three explorers. Choose three from a pool of six, keeping in mind you’ll need one from each area of expertise (jungle, navigation, camping). Each person is dealt four adventure cards (six if playing with only two players) and a decision must be made with how hard you want the game to be. Use seven expedition cards for an easy adventure and nine for a normal or hard challenge. How much health you begin with also depends on the difficulty, so choose wisely! 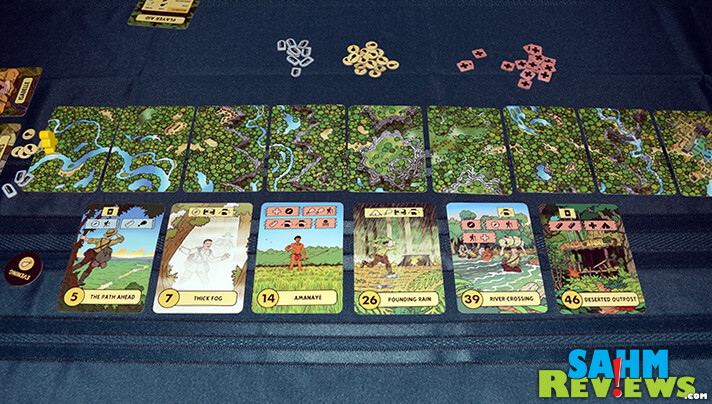 These expedition cards are placed in a row in the center of the table, ending in the lost city. 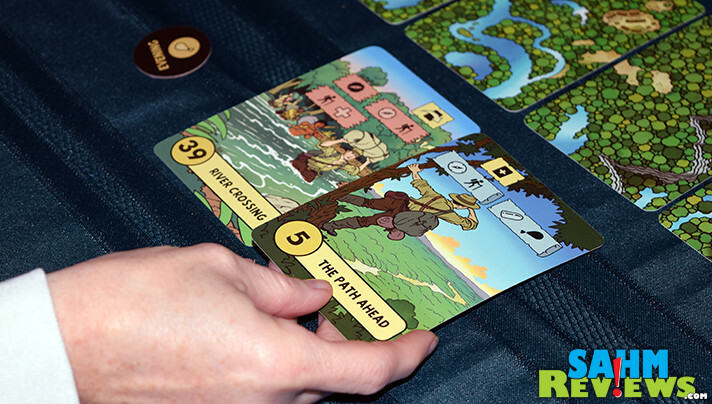 An included pawn is set on the first expedition card and a custom Morning/Evening token is set to “Morning”. You must get your team (the pawn) to the final expedition card before all of your explorers die or you run out of time. The core of The Lost Expedition is the adventure cards in your hand. Each one represents an encounter and you’ll need to make sure they take place in a survivable order. Some cards have positive outcomes, others negative. On each card are boxes with symbols inside of them. Yellow boxes must be resolved. Blue boxes are optional and you may choose to resolve or ignore them. There are usually multiple red boxes on a single card, and you must choose one to resolve, ignoring the rest. The symbols inside the boxes can be construed as actions and can affect the team, cards on the table or the entire expedition! Some have you discarding cards, others moving your pawn. Yet another allows you to gain food for when a later card asks you to spend it. As you probably already guessed, card order will be a very important part of the game. Each round is played over two phases, a “Morning” and an “Evening”. For the morning phase, each player plays two cards (one at a time) from their hand to the center of the table. These cards are then arranged in numerical order in a row and resolved left-to-right. Any time you are instructed to spend an item but haven’t collected enough, your explorer loses one health. You’re looking to resolve the symbol that resembles a hiker. This allows you to move your pawn onto the next expedition card. When all of the cards for the Morning phase are completed, the team loses one Food token (hey, they get hungry too!) and the game moves on to the next phase. The Evening phase is played similarly, except you must now play your remaining two cards, one at a time, to the table. They are not arranged in numerical order, instead they are lined up in the order played. Once again they are resolved in order from left to right and then the team loses one additional food. At this point the leader token is passed to the next player and everyone draws four new cards. If the adventure deck becomes empty, the players immediately lose one food before shuffling the discard deck to use again. 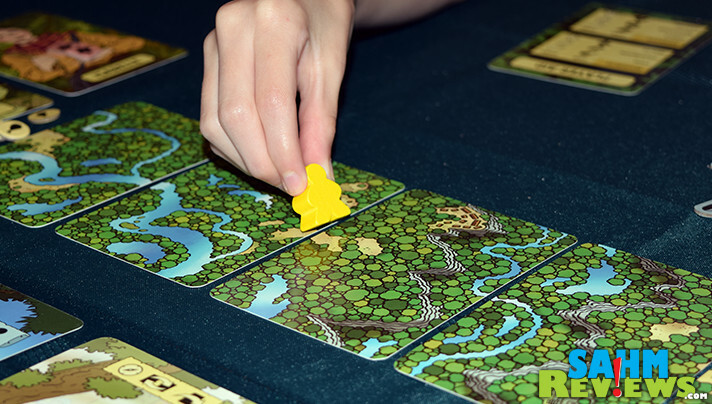 If the deck runs out a second time before the explorers get to the lost city, the players immediately lose. We haven’t played The Lost Expedition enough times to give you an accurate win percentage, but can say it is not an easy game. 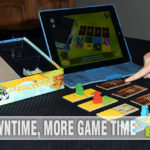 We found that with four or five players, it is much more difficult than with just three. You will be somewhat hampered by the luck of the draw, but the abilities of the players to communicate and coordinate will be the most important skill needed to be successful. 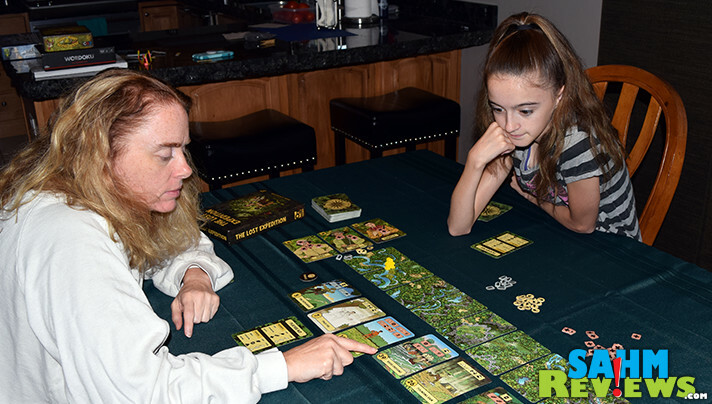 A typical game of The Lost Expedition should run 30-45 minutes and can easily be played by youth as young as 8 or 9, even though the box recommends 14+. That is assuming there is at least one older player around to help with the rules. If you’re at Gen Con this week, pick up a copy at Osprey Games‘ booth #2535 for around $30. 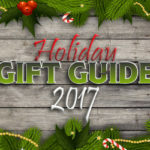 You’ll also find it offered at your local game store as well as on Amazon. Wait until you see what’s coming down the pipeline this fall – I hope you’re following them on Facebook and Twitter because that’s where you’ll get the scoop! If this sounds like your kind of experience, enter to win a copy using the form below. Yes, I would love to see all of the exotic insects! Yes, I would love to go on a jungle expedition but with lots of people! Yes i would! It would be tons of fun! Not on a normal Jungle expedition, too many bugs and too much humidity! I’d love to try one of those zipline tours though. There is no way I’d go on a jungle expedition. Too many thinks in the jungle can kill you and besides, it’s too hard to play board games in the jungle. I’d like to live, thanks anyway. I say let’s throw caution to the wind and get to the jungle! I would love to go on an another jungle expedition. I’ve been to Palenque, Mexico. Yes, I would definitely consider going on a jungle expedition! Thought about it to see some of the exotic birds in the Amazon, but health wont permit it. Nice dream. When I hear jungle, I think stay away. I have never heard of this game but it seems interesting…will definitely check it out! Yes, I like jungle expeditions. I went to Costa Rica back in high school and we got to take several trips through the rain forests. I’m not sure! I’m afraid of poisonous snakes lurking under the bushes! I think that would be fun, but I would have to research to pros and cons more. I would absolutely partake in a jungle expedition! It might be a little dangerous but that’s part of what makes if more exciting. Depends what we were looking for. 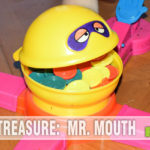 Treasure? Sure. Lost tribe of cannibals? No, thanks. Yes, the jungle would be awesome. Yes, I would like to go on a jungle trip. I would consider going on a jungle expedition. I would love to explore the Amazon jungle. I would consider going on a jungle adventure. Yes, I would definitely consider going on jungle adventure, especially since there is so much wildlife that resides in one that I would like to see up close and personal. Thanks for the fantastic opportunity to win!